Unleash Your Creativity Into Motion With The New EOS M. It is the Newest Mirroless Camera in Canon’s Lineup Delivers Exceptional EOS Full HD Video Quality with Continuous Autofocus and a huge Selection of Lenses. 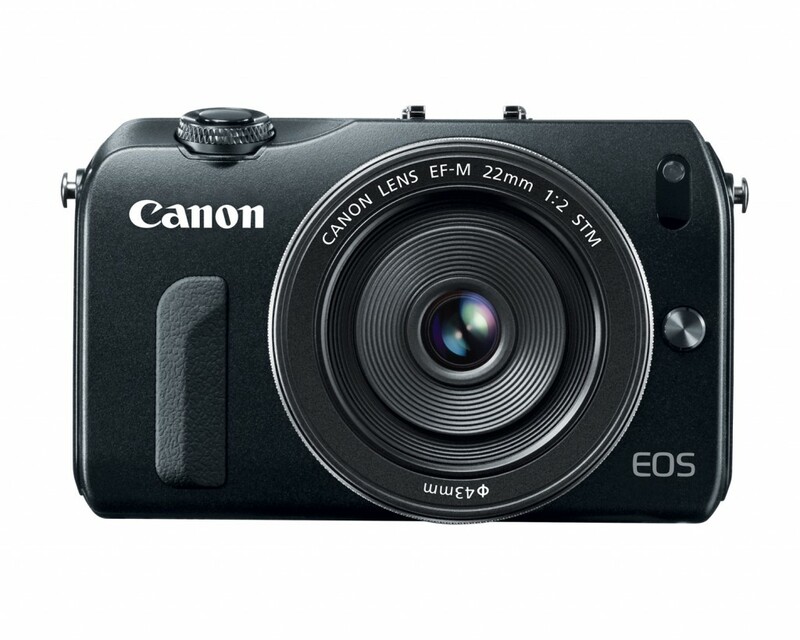 The Canon EOS M is an entirely new MILC system based on an 18MP APS-C CMOS sensor that can produce image quality that is comparable to that obtained by Canon’s best DSLRs. 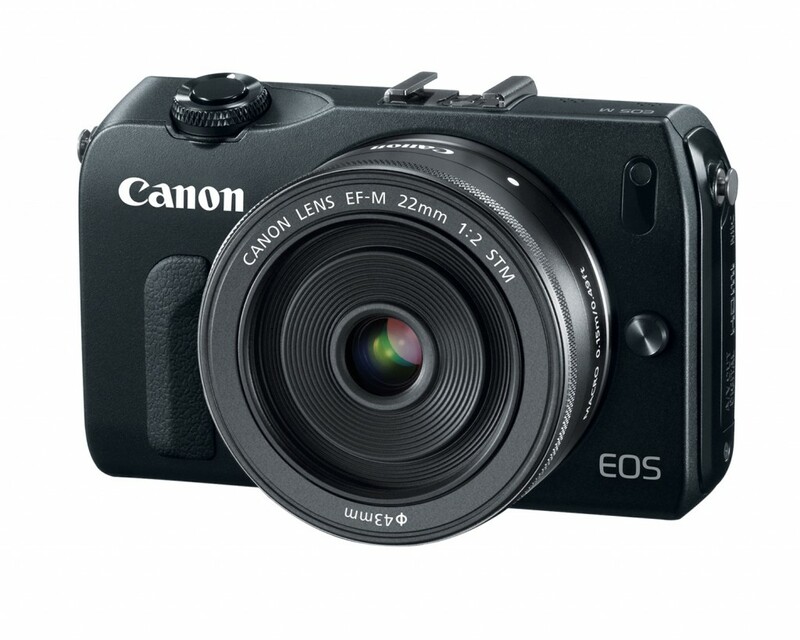 Canon is emphasizing the EOS M primarily as a movie-making tool and secondarily as a still camera, but its specifications make it impressive in both. It has a built-in stereo microphone (with manual audio adjustment), manual exposure control and multiple resolution frame rates, as well as a video snapshot mode with touch-screen editing. The Movie Servo AF mode, which is the camera’s default setting, is claimed to be able to track moving subjects. The two new lenses introduced with the EOS M use STM (Stepping Motor Technology) for virtually silent autofocus that won’t be picked up by the camera’s internal microphone. 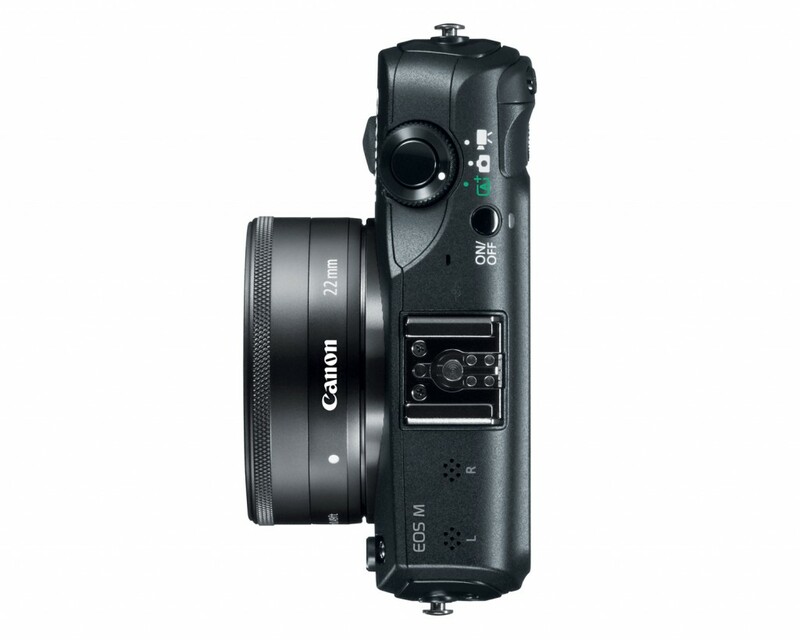 The Canon EOS M features a hybrid CMOS AF system that employs both contrast detection and phase detection autofocus techniques. 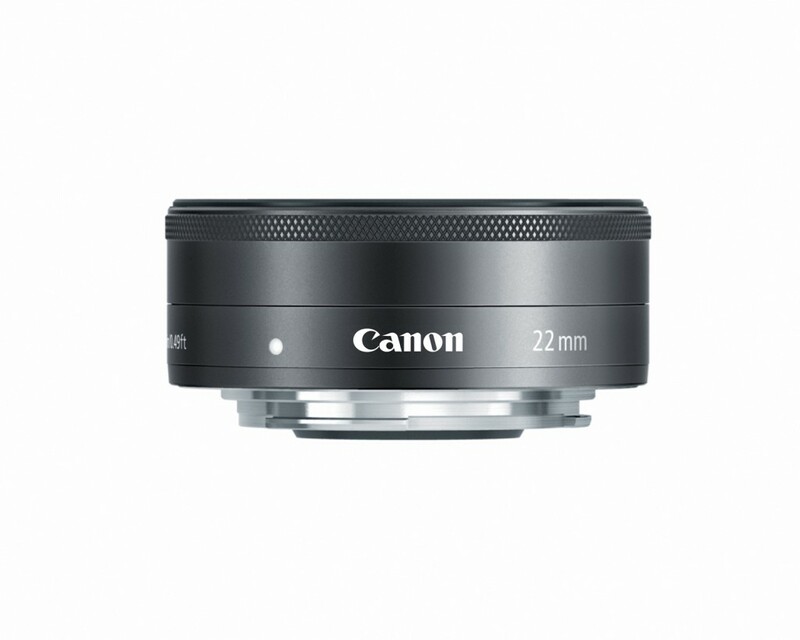 In competing systems this hybrid approach has allowed for minimal focus time, and indeed, Canon claims speedy snap to focus for the M system with reduced shutter lag. Face Detection, Tracking AF, Multi-Point AF with 31 autofocus points as well as single-point AF are all user-selected focus options. Touch-screen operation activates subject recognition and tracking; users can use touch-screen to navigate the menus for both still and video. 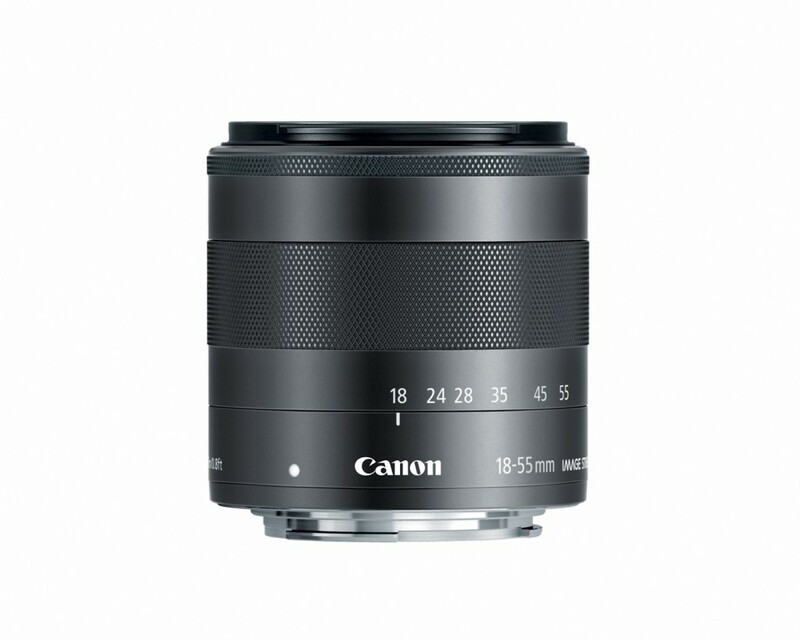 A new camera mount and short flangeback design (which brings the rear lens element closer to the surface of the sensor) means a new lens system based on the EF-M mount, and the EOS M arrives at birth with two lenses, an EF-M 18-55mm f/3.5-5.6 IS STM kit lens (35mm equivalent: 29-88mm) and the new EF-M 22mm (35mm equivalent: 35mm) f/2 STM pancake lens. 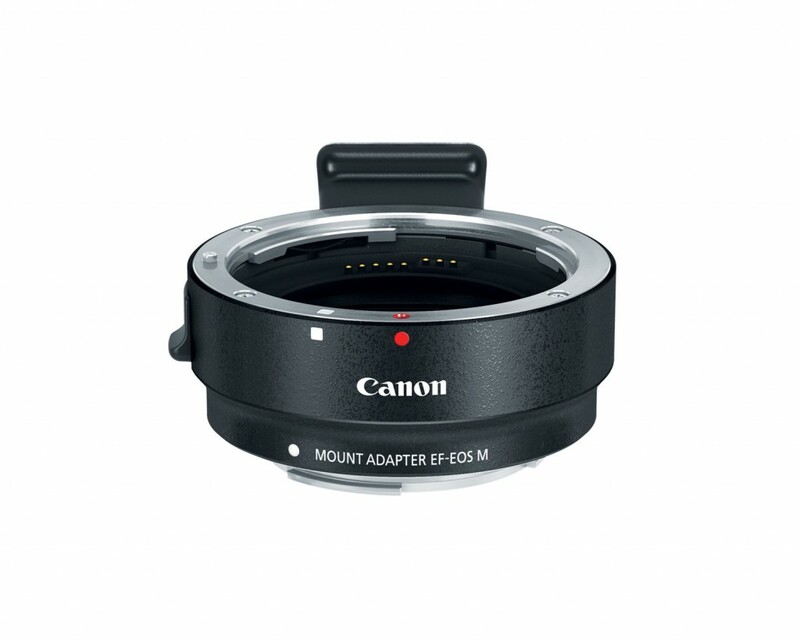 Owners of Canon EOS DSLR systems can also rejoice: Canon also announced the Mount Adapter EF-EOS M, which allows you to mount any Canon EOS EF and EF-S lens. 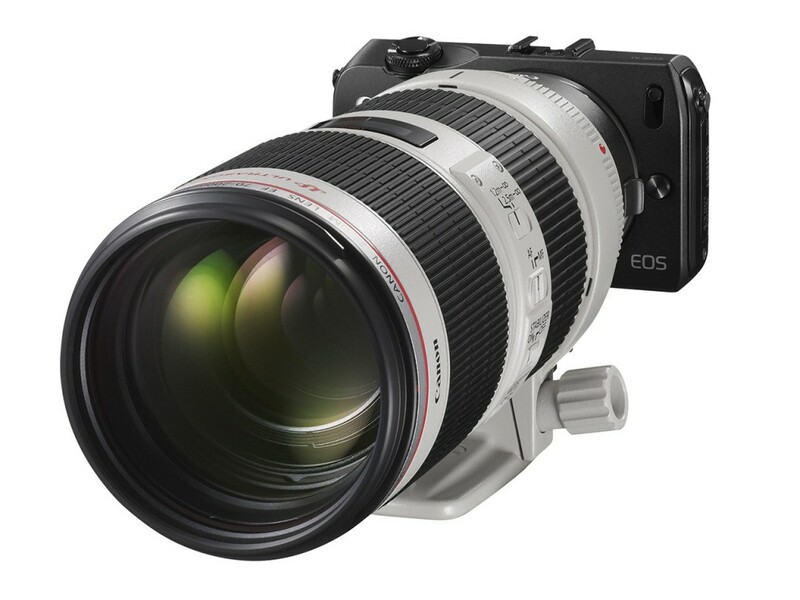 With over 70 lenses currently available, the Canon M becomes another part of the Canon EOS ecosystem. Finally, Canon also announced the Canon Speedlite 90EX, which is closely matched to the Canon M but can also be used with other Speedlites. The Speedlite 90EX boasts a 24mm angle of coverage, and a maximum guide number of 30 feet at ISO 100. 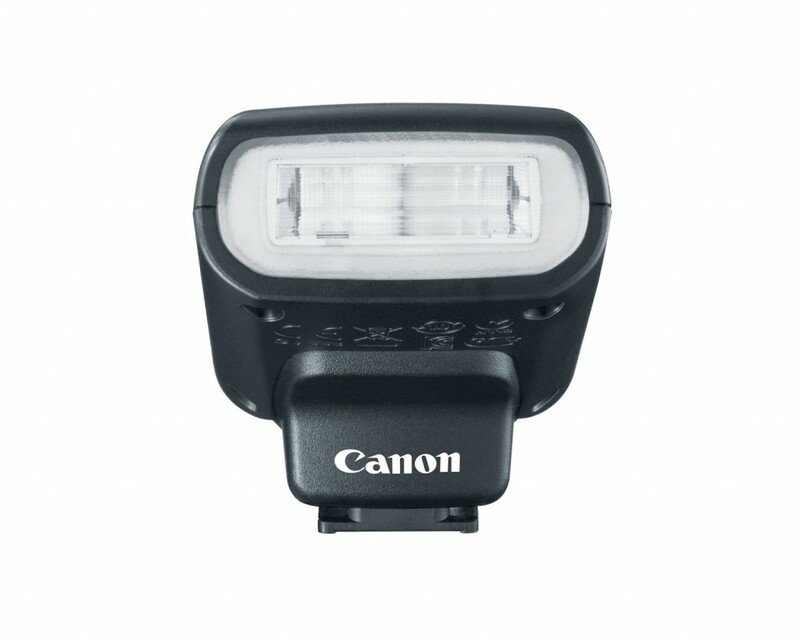 The M is fully compatible with the entire Canon Speedlite line, and can control multiple speedlites wirelessly. 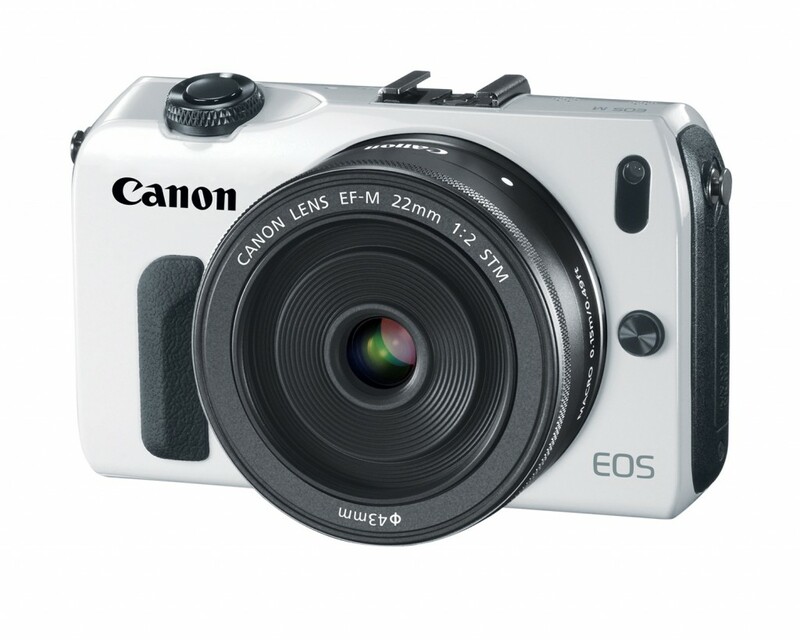 Canon EOS M is ideal for snapshooters, travelers, and first-time interchangeable-lens camera users. 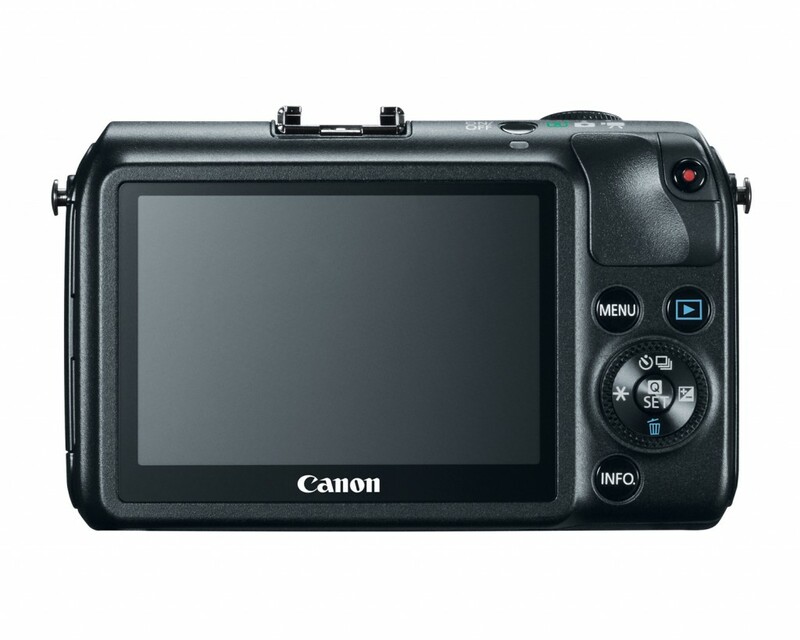 Measuring 4.3×2.6×1.3 inches (without lens) and weighing a mere 10.5 ounces (body only, with battery), the camera is small and light. The top of the camera, from left to right, features left and right microphones, a flash/accessory mount (yes, you can mount the Canon TK GPS system), an on/off switch, and a shutter release surrounded by a rotating switch that lets you choose Auto+, still camera or video modes; choices within each mode can be found within the menu structure. A nice design element: The shutter release is nestled in a comfortable tilt within in a carved out wedge. With the flash mount so close, this makes sense because it reduces the likelihood that your shooting finger will bump up against the bottom of the mounted flash. The back of the camera is dominated by the 3 inch LCD monitor which is built in and doesn’t rotate, but which boasts a very high 1.04 million dot resolution. A menu button accesses menu controls, while a preview button lets you look at stills and videos. A “Q” button also doubles as a feature set button, and is surrounded by a four-way circular toggle switch to control burst rate and self-timer, EV control, image delete, and an assignable function option indicated by an asterisk. An info button lets you control what information appears on screen during shooting or preview modes. On the left side of the camera a door opens to reveal AV/Out digital and HDMI ports, as well as an external mic jack, and the front of the camera simply has a small grip protrusion, the lens mount and release button, and the infrared focus aid. There is no eye-level viewfinder option. 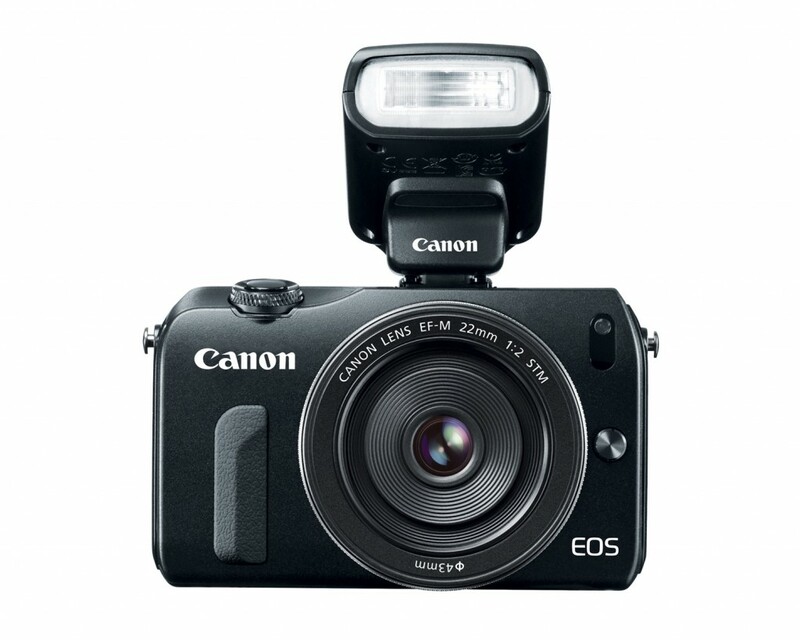 Despite its simplified layout, the Canon EOS M is solidly built. 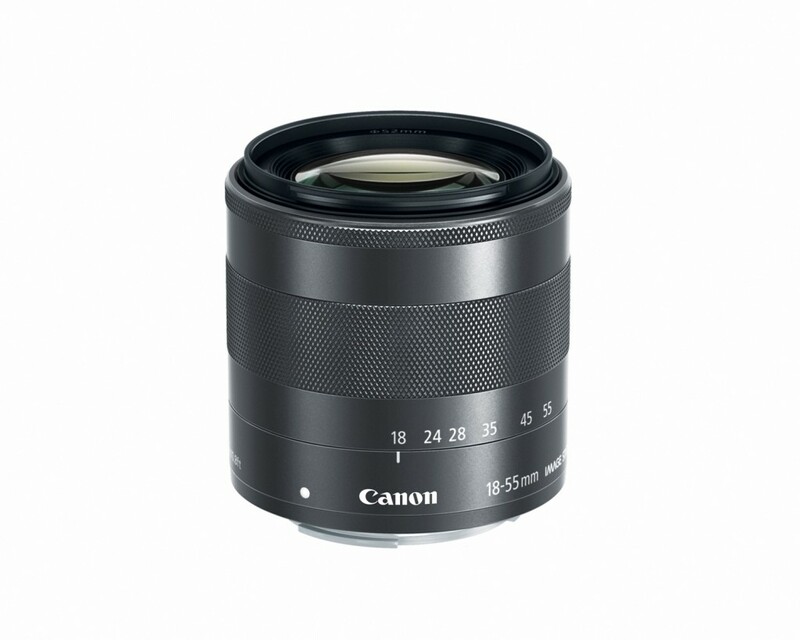 Its chassis is constructed of magnesium and stainless steel, and Canon says the body can, via the EOS lens adapter, be fully integrated into the entire line of Canon DSLR lenses.